While the many treatments that Ken Anderson and other Imagineers proposed for the park's "Haunted House" were being discussed and debated, the look of the attraction's facade was being honed. Though early treatments by Harper Goff, Sam McKim and Anderson tended to lean on the standard ramshackle neglect generally attributed to possessed architecture, Walt Disney didn't like the direction the concepts were taking, as he didn't wish to have his park sullied with the look of decaying buildings. At the same time, WED Imagineers were beginning to research other "haunted" abodes for ideas related to the interior design of the Mansion - such as the reclusive widow Sarah Winchester's mansion up in San Jose, CA, or the fictional house in Robert Wise's 1963 film "The Haunting." "We'll take care of the outside, and let the ghosts take care of the inside." - Walt Disney, requesting that the Haunted Mansion always appear neat and tidy. "The house exterior was to appear run down and decrepit," Anderson told The E-Ticket magazine. "Some of the ride elements were described based on the house being all moldy and unsafe... (guests) would have walked through once-beautiful grounds which had become neglected, and pass a graveyard filled with tombstones and partially uncovered bones." But Anderson acknowledged that Walt wasn't supportive of the concept. "They'd get in there and whoa, everything would be decrepit and old. But that was one thing that Walt didn't like. (He wanted) everything to be new and swanky and swell." Though Walt's opinion may appear to contradict some of the intentional designs of modern Disney Imagineers, it should be remembered that Disneyland was created in part to intentionally provide an escape from the seedy carnival of the day. Today's theme parks are set in a different cultural surrounding, and therefore, Disneyland Paris' Phantom Manor's deteriorating exterior (for example) doesn't lead guests to wonder how the park's operators let the place become so run down. Back around 1970, some WED Imagineers visited Jim Thorpe, Pennsylvania and studied the Harry Packer Mansion, using it as reference for the new Haunted Mansion that was to be built at the Magic Kingdom. You, too, can visit this four-diamond AAA resort situated two hours from New York. Regular features include murder mystery weekends and victorian balls. Check it out at MurderMansion.com. The John Hopkins University owns the historic Evergreen House, built in Baltimore in 1858 and left to the University by the Garrett family. As with the Harry Packer Mansion, Disney artisans visited the Evergreen House in search of details to help lend authenticity to the Disneyland Mansion facade. The Evergreen House is also available for tours of its amazing collections and rare book library. Find out more by clicking here. Ken Anderson took a trip to up north to San Jose to visit Sarah Winchester's 160-room "Mystery House" in a quest for ideas. The building, which contains staircases that lead to nowhere, doors that open to bricked walls, and a recurring theme of "thirteen," surely offered plenty of eerie inspiration. Find out more by clicking here. While there were many influences on the Mansions' final architectural designs and the decorative details (see sidebar at left), Anderson was most influenced by a catalog of Victorian decorative art and architecture that was part of the WED library. This collection, compiled in 1950 by Frances Lichten, contains some of the most compelling examples of imagery that influenced the Mansions' designs - most notably, a Baltimore mansion that is clearly the inspiration for the Disneyland show facade, and an engraving that seems to have heavily influenced the layout of the Walt Disney World Mansion facade. The photo and the illustration above are both from Lichten's catalog, and both were clear influences in the external facade design of the first two Haunted Mansions. In fact, Ken Anderson's original sketch of the Haunted Mansion exterior was copied from the photo above, down to the fine details and perspective. The "castellated stone villa," on the other hand, may not have been as influential on the Walt Disney World Mansion's facade, but it is hard to deny the similarities. Disneyland historian "Progressland" of Disneyland Nomenclature has discovered that the Lichten photograph depicts the Shipley-Lydecker house of Baltimore, which was built in 1803 and located at 2550 McHenry Street (although the structure no longer stands.) Ironically, the house was noted primarily for the lace ironwork, and the building would likely have faded into obscurity were it not for "some later owner of a taste less pure, (who) has embellished it with a double gallery all around, decorated with cast-iron work more fantastically elaborate than anything in Baltimore" (according to Footner Hulbert, author of Maryland Main and the Eastern Shore [Tradition Press, 1942]). Thanks to the notable iron bling, the house was photographed and documented, one day to be discovered in the WED library. Intriguingly, at some point in the house's history, it was used as a memorial for the dead of World War II. Jason (aka "Progressland") also managed to track down the illustration above, taken from The Shipleys of Maryland (Gateway Press, 2002). "When I got the concept artwork (based on the Baltimore house) for the exterior finished, (Walt) said he didn't like the idea at all," Anderson recalled to The E-Ticket. "I never thought I'd see it again. I was never more surprised to find out later that the concept became the basis for the look of the Haunted Mansion as it was eventually built, because Walt didn't like it." 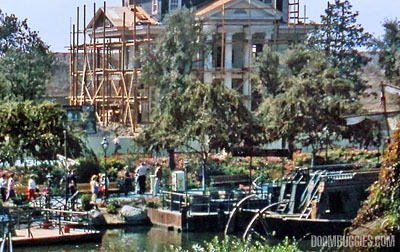 The photos above show construction underway of the Haunted Mansions at both Disneyland in 1962 (left, center) and Walt Disney World in 1970 (right). Once the Disneyland Mansion's exterior facade was completed, it stood unoccupied for much of the decade, because Walt Disney decided it would be important for him to use his top staff to create attractions for the 1964-65 World's Fair in New York. In doing so, WED developed many new techologies and techniques to use in their continuing efforts at Disneyland, and Disneyland gained the new attractions developed for the World's Fair, which were Great Moments with Mr. Lincoln, it's a small world, the Carousel of Progress, and the Primeval World diorama just outside of Tomorrowland on the Disneyland Railroad trip. Listen to Disney voice talent Paul Frees try a variety of early accents as the "Ghost Guide," a character considered for the role of narrator of the Haunted Mansion attraction. Note his mention of the "black cat," which was a character that was intended to repeatedly show up throughout the attraction, though the idea was not used in the final version of the ride. As the effects and storyline were continuing to be debated, even the title "Haunted Mansion" seems to have been up for grabs. As a result, various titles, including "Haunted House" and "Ghost House" were used on products and news stories created well after the ride was well-known as the Haunted Mansion, such as this jigsaw puzzle which portrays Mickey Mouse and Goofy within a fully-developed scene of the attraction. Disneyland voice talent Paul Frees even began recording some trial dialogue tracks as the "Ghost Guide" that refer to the attraction as the "Haunted House." For the latter half of the '60s, curiosity and interest in the Mansion grew tremendously, as people wondered what waited for them inside the doors of the mysterious facade. With the opening of Disneyland's Pirates of the Caribbean attraction, WED had established itself in the world of entertainment and robotics as a design group without peer. And now, speculation was running rampant about this dark ride designed to beat all other dark rides. In fact, many rumors were started during this era; rumors of missing contruction workers, or glimpsed apparitions within or nearby the attraction facade. After construction had started (but before WED would be caught up in work for the World's Fair), Disneyland promotional material had announced that the Haunted Mansion would be opening in 1963. Explaining the apparent delays, the brochure noted that "Gathering the world's greatest collection of ghosts is no easy task!... But Walt Disney has had his talent scounts searching for several years..."
A sign was also posted just outside the newly-installed iron gates, announcing that "Post-lifetime leases" were available for the Haunted Mansion, and that those leases included "license to scare the daylights out of guests visiting the Portrait Gallery, Museum of the Supernatural, graveyard, and other happy haunting grounds..." Notable is the mention of the "Museum of the Supernatural," which is undoubtedly a reference to the not-yet-discontinued "Museum of the Weird" Rolly Crump had been working on. WED posted this sign outside of the fully-constructed Haunted Mansion exterior, finally advertising the Haunted Mansion's opening. It reads, in part... "999 Ghosts and Restless Spirits have chosen active retirement in the Haunted Mansion. Should you desire to become number 1000, visiting privileges begin late summer 1969..."
By all measures, the Haunted Mansion remains a landmark in dark ride history to this day. In the 1999 Guiness Book of World Records, the Haunted Mansion was even honored as the World's Largest Dark Ride.